Module-dependent. Refer to the documentation for each C Series module. The protection provided by the NI cDAQ-9184 chassis can be impaired if it is used in a manner not described in the NI cDAQ-9181/9184/9188/9191 User Manual. Some C Series modules have additional power requirements. For more information about C Series module power requirements, refer to the documentation for each C Series module. Sleep mode for C Series modules is not supported in the NI cDAQ-9184. The maximum power consumption specification is based on a fully populated system running a high-stress application at elevated ambient temperature and with all C Series modules consuming the maximum allowed power. 178.1 mm × 88.1 mm × 64.3 mm (7.01 in. × 3.47 in. × 2.53 in.) Refer to the following figure. If you need to clean the chassis, wipe it with a dry towel. Do not connect the system to signals or use for measurements within Measurement Categories II, III, or IV. To maintain product performance and accuracy specifications when the ambient temperature is between 45 and 55 °C, you must mount the chassis horizontally to a metal panel or surface using the screw holes or the panel mount kit. 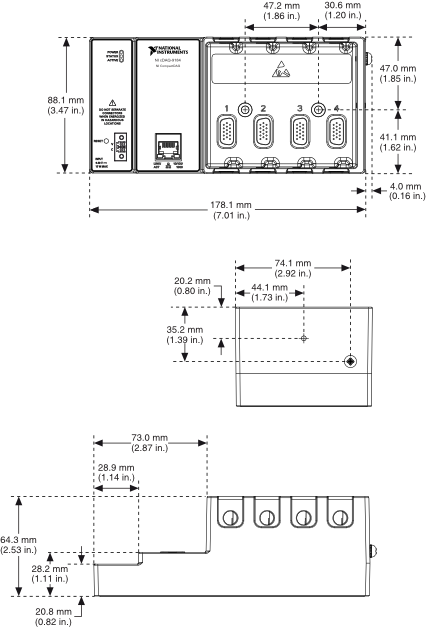 Measure the ambient temperature at each side of the CompactDAQ system 63.5 mm (2.5 in.) from the side and 25.4 mm (1.0 in.) from the rear cover of the system. For further information about mounting configurations, go to ni.com/info and enter the Info Code cdaqmounting. To meet these specifications, you must direct mount the NI cDAQ-9184 system and affix ferrules to the ends of the terminal lines. 1 Performance dependent on type of installed C Series module and number of channels in the task. 2 Does not include group delay. For more information, refer to the documentation for each C Series module. 3 Actual available signals are dependent on type of installed C Series module. 4 When a session is active, CAN or LIN (NI-XNET) C Series modules use a total of two data streams regardless of the number of NI-XNET modules in the chassis. 5 Includes maximum 1 W module load per slot across rated temperature and product variations. 6 When operating the NI cDAQ-9184 in temperatures below 0 °C, you must use the PS-15 power supply or another power supply rated for below 0 °C.